The two young men from Mexico contend they are role models at the forefront of U.S. history, but critics denounce them as illegal immigrants whose seating on city commissions is wrong. Julian Zatarian, 21, and Francisco Medina, 29, were appointed to advisory commissions this week even though they are undocumented immigrants, becoming what the sponsoring councilman calls among the first for local governments nationwide. At the vanguard in this Southern California town are Zatarian, now a junior college student who graduated at the top of his class at Huntington Park High, and Medina, a graduate of a California state college who works with working-class immigrants and recently interned for a state legislator. “I believe this is a historic moment. It is the first time that we have undocumented persons who are taking positions of this magnitude in a city, and that shows our society is progressing,” Zatarian told CNN en Espanol. 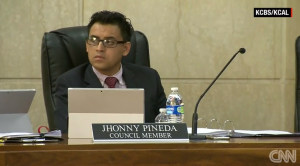 “It’s a great message that we’re sending not only here in Huntington Park but in other cities as well,” Medina added.